Acknowledgement: This work has been summarized using the Farrar, Straus, & Giroux 1995 edition, translated by Robert Pinsky in 1994. Quotations are for the most part taken from that work, as are paraphrases of its commentary. Some of the notes and quotes derive from the Princeton Dante Project and the Wikipedia. Texts and Translations: The line structure consists of hendecasyllable (11-syllable) lines with final accent usually on the tenth syllable. The terza rima verse form consists of tercets with terminal rhyming pattern ABA BCB CDC DED, etc.) The Pinsky is an excellent terza rima verse translation and the Robert and Jean Hollander translation (at the Princeton Dante Project ) is a readable contemporary verse-like but non-rhyming translation. Both of these sources also include the original Tuscan-Italian text and are well-annotated. I found the Pinsky edition preferable in many respects to the more recent translation by Ciaran Carson. Overall Impression: Inferno is a must read from the Western canon, a fascinating and imaginative allegory, in part a depiction of the nature of damnation from the medieval Christian point of view. Notes per the Pinsky edition and other sources: The Commedia (later termed Divina Commedia by Boccaccio), consists of three cantiche or canticas (singular, cantica): Inferno, Purgatorio, and Paradiso, altogether subdivided into 100 cantos. It was written between 1308 and the year of Dante's death, 1321. The historic blood feuds between the Black Guelphs, White Guelphs, and the Ghibellines play a major role in the story and individuals encountered in Inferno—Dante had been exiled (before the time of writing) from Florence as a member of the losing party, the White Guelphs. There is no element of Christian forgiveness in Inferno. Often the souls are punished in a manner akin to the nature of their sins in life—called "contrapasso". They reach a gate in the evening (which famously warns "Lasciate ogne speranza, voi ch'intrate" = "... Abandon all hope, you who enter here")—it marks the entry into "the city of woe". Outside the gate, Fore-Hell is populated with Neutrals and Waverers who would not commit to God and are condemned to spend their afterlife futilely chasing a meaningless banner. 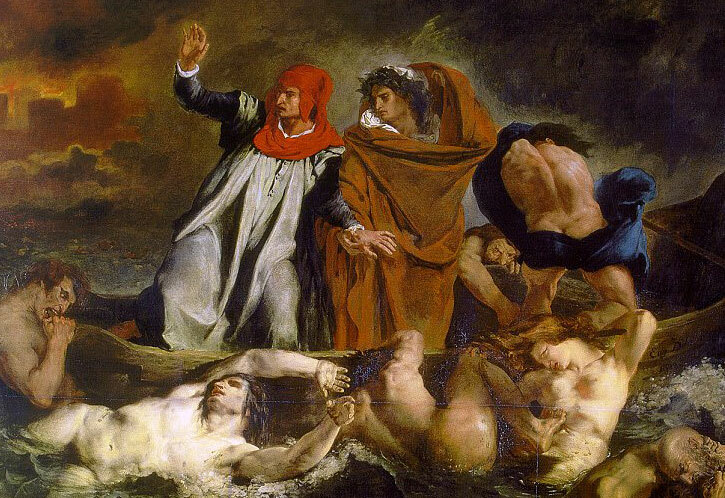 Passing through the gate, they proceed beyond the River Acheron guarded by Charon into the First Circle (Limbo). Limbo is populated by the Unbaptized such as the pre-Christian pagans. Some of the Old Testament noble Hebrew figures have been carried to heaven during the "Harrowing of Hell" that occurred after Christ's death in in 34 A.D. but before his resurrection. Noble pagans such as Homer, Lucan, and Ovid, Aristotle, Hippocrates, Avicenna, Averroes, Galen, even Saladin and certain other Muslims, live in Limbo, some in a noble castle. The lower circles of Hell are concentric rings each positioned lower than the previous and with a smaller circumference, like a funnel. Minos, now a beast, serves as the judge to send sinners to their final destinations beyond Limbo. The 2nd Circle contains the Lustful (the 2nd-5th Circles are for the Incontinent Sins), including Semiramis, Cleopatra, Helen, Dido, Paris, and Tristan. Francesca Maletesta of Rimini tells of how she and her lover Paolo Malatesta (her husband's brother) read an Arthurian romance that provoked their lustful passion and adultery. The Third Circle is for Gluttons such as Ciacco ("hog") and has the beast Cerberus. The Fourth Circle is for Spenders & Hoarders (including avaricious clergy) and has Plutus. The Fifth Circle is for the Wrathful and Sullen such as the Black Guelph Filippo Argenti and has the beast Phlegyas. They near the city of Dis (also used as a synonym for Satan) across the River Styx. The Sixth Circle (Dis) is for Heretics such as Epicurus, Farinata (a Ghibelline leader), Cavalcante de' Cavalcanti (an Epicurean Guelph), Frederick II (Holy Roman Emperor 1194-50), Pope Anastasius II, and some Muslims. This circle has the furies (Erinyes) Medusa, Megaera, and Alecto. They descend across the Phlegethon River into the Plain of Fire Circle VII (Violent Sins), first into Ring 1 (Violence toward Others) where Chiron the centaur, Nessus (who killed Hercules), Attila, Rinieri, and others are found along with the Minotaur. Circle VII Ring 2 is for those committing Violence toward Self (suicide and wanton spendthrifts) including Pier della Vigna and Arcolano da Squaricia, and has the Harpies. They are carried by the beast Geryon to the Eighth Circle ("Malebolge"="Evil Pouches") for those committing Sins of Fraud. It has 10 pouches (also called fosse, bolgie, valleys, or ditches— circular concentric depressions spanned by bridges). The beasts there are the Malebranche. Pouch 7: Thieves (e.g., Vanni Fucci, a Black Guelph thief, Cianfa Donati, Pucio Sciantolo, Agnello Brunelleschi, Franscesco de' Cavalcanti, Buoso). They are lowered by the giant Antaeus to the Pit or Ninth Circle (the "seat of Dis [Satan]"), for Sins of Betrayal. There are giants from various mythologies (Nembrotto=Nimrod, Fïalte=Ephialtes, Brïareo=Briareus, Anteo=Antaeus, etc.) ringing the pit, and Lucifer is buried within. At Caina (outer Cocytus, a frozen lake) are betrayers of Kin: e.g., Cain, Mordred [King Arthur's nephew], Allesandro and Napoleone. At Antenora (inner Cocytus) are betrayers of Country or Party: Antenor, Ugolino—who ate his child while imprisoned by Archbishop Ruggieri—Bocca degli Abati, Gianni, Buosa da Duera, Tydeus, and Menalippus. At Ptolomea are betrayers of Guests: e.g., Friar Alberigo, Ser Branca d'Oria. In Judecca, the final division of Cocytus, are betrayers of Benefactors—e.g., Brutus, Judas Iscariot, and Satan=Lucifer=Dis=Belzebù. Lucifero's head has three faces, and out of each face's mouth dangles a victim: Judas Iscariot's head is locked inside the mouth while his legs flailed loose, whereas Brutus and Cassius's heads hang down from the mouth. Satan's waist is exactly at the center of the earth. Virgil leads Dante past Satan, inverts himself 180 degrees, and begins now to ascend in the southern hemisphere, still on the morning of Saturday April 9, 1300 [time zone has changed]. They emerge eventually and can see the stars. The only land left in the southern hemisphere is Mt. Purgatoria (directly opposite Jerusalem), his next destination. The journey in Hell and the ascent each lasted about 24 hours.